A simple scrunchie collar can provide a fashion statement for your pooch without a lot of work. These are not much different than making the ones for your hair. You can allow your dog's personality to shine through and not have to be an expert crafter. Measure your dog's neck with a cloth measuring tape. Cut out a piece of fabric about 40 to 60 inches long. The exact length will depend on the size of your dog and the amount of scrunch that you want. Make sure that your fabric piece is at least 2 inches wide. Fold your fabric inside out, lengthwise, and stitch the top edge closed. The ends will still be open, so pull your tube right side out. Cut a length of 1/2-inch elastic 1 inch longer than the measurement you took of your dog's neck. Fasten a safety pin to one end and feed the elastic through your fabric tube. Pull your fabric away from the ends of the elastic and stitch the ends together to make a circle. Tuck the ends of your fabric in to give a clean edge. Slide your ends toward each other until they meet over the stitched seam of the elastic. Stitch your fabric together directly across the elastic. Distribute your fabric evenly and trim away any excess threads. 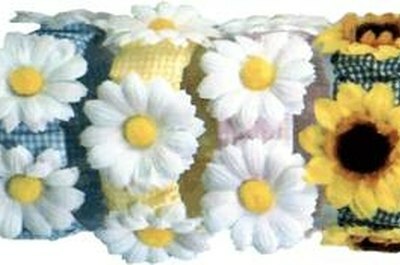 Decorate your collar with flowers, buttons, rhinestones, charms or anything you choose. Be careful of small pieces that may be a choking hazard for your dog.